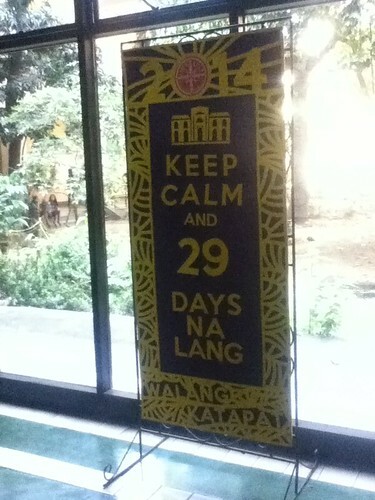 Three hours before I "graduate"
SPOTTED along the PGH lobby was this sign, in purple and yellow (our class colors, reminiscent of ube and cheese), declaring how close we are to the End. I hardly noticed this, though, as I was late for the daily Summary Rounds at 7 am. I arrived at 7:10 am, just in time to sign the Attendance Logbook. Who was the friend who made me realize that PGH is perhaps the only institution in the country that helps the logbook industry survive? There are logbooks everywhere. Attendance logbooks. Specimen logbooks. Patient logbooks. Referral logbooks. Instrument logbooks. May I suggest the following: (1) a logbook for all the unique names of babies born at PGH, (2) another logbook for consultants who have walked out of small group discussions or conferences and the corresponding reasons for doing so, and (3) another logbook for usage of restrooms. I sat beside fellow late-comers Jonas Bico (the class president! ), Joseph Brazal (my go-to man for anything historical), and Nic Bernardo (who can wear blood-stained rags and still look gorgeous). 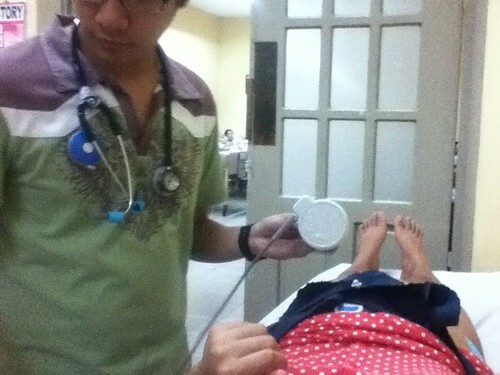 Ching Ching (even her mother Tita Gloria calls her Ching) was endorsing her patient before the Chief Resident. She did well, as always. At the Intensive Maternal Care Unit was forever-blockmate Franco Catangui, doing the daily fetal well-being studies for his pregnant patients. I assisted in a five-hour surgery (altogether now, let's recite: "exploratory laparotomy, peritoneal fluid cytology, extrafascial hysterectomy with bilateral salpingooophorectomy, bilateral lymph node dissection, paraaortic lymph node sampling, random peritoneal biopsy, infracolic omentectomy") with the Gynecologic Oncology fellows. The case was rare (although no case is truly rare at PGH): malignant mixed mullerian tumor. I was asked to define the anatomy of the female genital tract—I was a disaster. We did complete surgical staging of the cancer. I had to fix 16 specimens. It took me more than hour to make sure everything was in complete order. 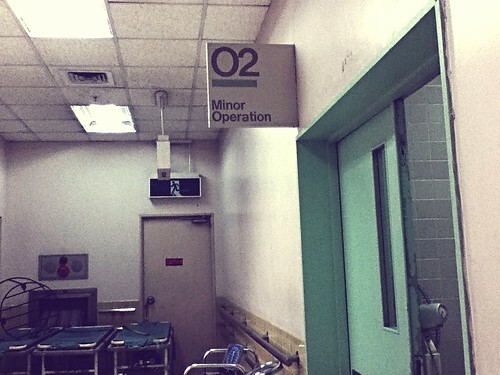 My experience a while ago brought me back to the the first time I ever entered the Operating Room. It was on August 12, 2011. 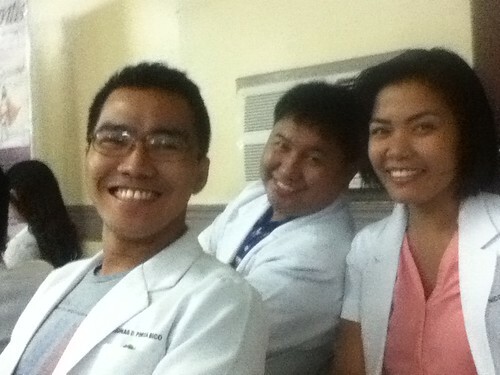 I was with Marvyn Chan and Jegar Catindig. We were too eager, my groupmates and I. We wanted to have a memorable first experience so badly that when the petite resident, already busy with her share of patients, asked us, "Do you want to excise a lipoma?" we immediately said yes. We had only seen lipomas in textbooks. Guided by our vague memories of Grey's Anatomy and our peripheral vision of more experienced interns and surgical residents, we performed the process of scrubbing in. The ritual was meant to keep everything aseptic. The friendly doctor then gave us instructions—where to make the incision, how to administer the anesthesia, what type of suture to employ in closing the wound. The general dictum is the see-one-do-one principle. We had only the hear-one-do-one because she had a number of patients to attend to. "If you have questions, I'll be in the first cubicle" was the only reassurance we got, but it was a comfort to at least have someone to call to when something went badly wrong. We had that "What do we do now?" look. To our relief the patient was able to go home alive. Gah. Kaya di ako magpapa-surgery (kahit minor) sa mga teaching hospital.